Underwear model Sarah Stage has left fans baffled as she shows off her six-pack while five months pregnant. The 33-year-old Los Angeles based model shared photos on her Instagram account that showcased her flat stomach and rock hard abs while pregnant with her second child. Sarah has previously made the headlines after flaunting her toned body following the birth of her first child, James, two years ago. 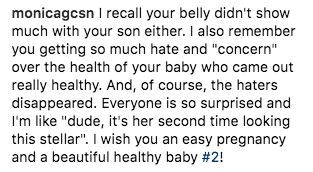 Just nine days after her first child was born Sarah was back to posting photos of herself wearing crop tops that showed off her amazing post-pregnancy flat belly. However, Sarah admits that there are differences with her body this time round compared with her first pregnancy. I have a little bump, but this time I’m carrying a little bit differently. The doctor says the baby is a lot lower. It’s exciting, and it’s such a short period of time that your body changes, and in the end it’s all worth it. The model, who has 2.1 million followers on Instagram, has attracted criticism with her toned pregnancy photos. Some claim that being so trim can be harmful to the child, although her first son James was born at a normal and healthy weight. Sarah’s barely there bump will of course upset some but we say hats off to her! Model and Fit Mom Sarah Stage Is Pregnant with Her Second Child: See Her (Barely There) Baby Bump!